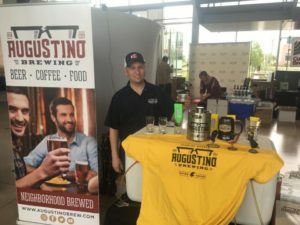 It was a long and short three months for this upcoming Wichita craft brewery and brewpub, but our Augustino Brewing Company team made it through the LaunchPrep Accelerator program. As a Wichita craft brew pub, we greatly benefited from the experience and have had our business model and plan forward revised and honed for success by our mentor team. We are looking forward to executing our strategy over the next handful of months. Our Wichita craft brew pub will bring you something truly unique through our outstanding beers and coffees as well as our unique membership model for our mug club program. One of the gifts we are giving you, your family, and your friends for following us and being a part of our journey is a $1 drink certificate for your first visit to Augustino Brewing Company when we open later this year. You can access this certificate on our website. We will personally acknowledge your request and give you some additional information about when to expect additional information regarding getting your $1 drink and update you on our progress toward opening our Wichita craft brew pub later this year. Whether you are looking to open a Wichita craft brew pub like we are, or you are planning to open any of a number of other businesses, our team would highly recommend teaming up with an accelerator program, such as LaunchPrep. It’s cliche, but very true, that it’s not so much about what you know as much as it’s about who you know. Napoleon Hill and other success authors talk about the importance of mastermind groups, which are groups of business owners from different industries who work together for common goals and to improve one another’s outcomes. By being a part of LaunchPrep, we have developed a mastermind group that will work together and help one another through our business challenges. Our team is extremely greatful for the opportunity to improve the business model for Augustino Brewing Company being a part of the LaunchPrep Accelerator has provided us. We are now bringing a very unique and very scalable model to the marketplace in a less crowded portion of the craft beer and coffee marketplace. We are now a “neighborhood-brewed” craft beer, coffee, and food experience. If we’re not in your neighborhood, we will hope to be there in the future, provided we have enough people who meet our core demographics within a 1-3 mile radius of future locations. There are many different Wichita craft brew pub locations to choose from and they all have good features worth checking out. However, we think our Ultimate Mug Club program, which had been an added feature to our business model since starting the LaunchPrep business accelerator, will make many people excited to come to Augustino Brewing Company day after day and week after week. Our Wichita craft brew pub is going to bring great beers, coffees, and food to the local Wichita brewing market that you won’t find anywhere else. If you’re a fan of eating and drinking, and after all, who isn’t, we think you’ll already have good reasons to come back multiple times to Augustino Brewing Company. However, by becoming an Ultimate Mug Club member, you will have a reason to integrate affordable luxury into your daily life. For one affordable monthly price, your first house beer or coffee beverage will be included, every day, for the entire month… that’s up to 31 beers or 31 coffees, or a blend of the two… all for one monthly price tag. We think it’s a great deal and we think you’ll agree. If that’s not enough, our Ultimate Mug Club members receive access to exclusive events and tastings as well as daily deals… on top of the included drink each day! There are a lot of great Wichita craft brew pub locations to choose from. We hope you’ll appreciate what we are bringing you and look forward to seeing you when we open our doors later this year. Thanks for your support and for eating and drinking local in Wichita!